Relax, it’s almost the weekend! To help get you through the next couple of days, ABCey presents you with the weekend lineup: the 5 FREE San Francisco events we are most excited about this weekend. 1. 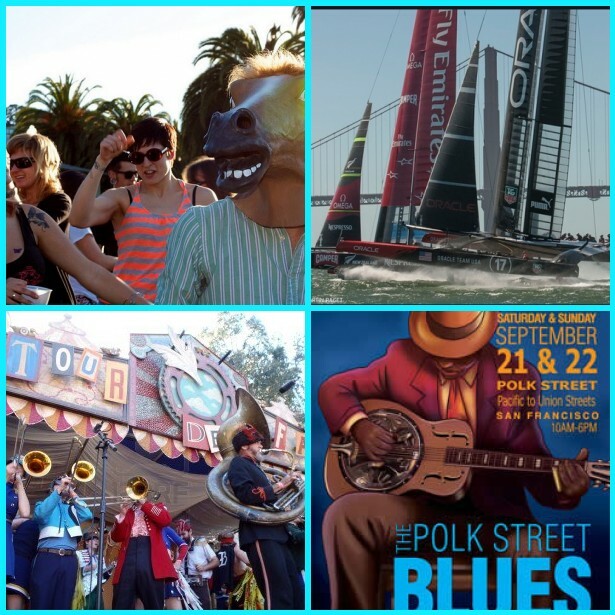 Polk Street Blues Festival | Saturday and Sunday, September 21-22 | 10 a.m – 6 p.m | Polk Street between Pacific and Union | As the only free blues festival in the city, the Polk Street Blues Festival is a celebration of music, food, and friends. Come out for live entertainment, gourmet food trucks, and art made by local artists. Let’s help make this one of the best free blues festivals in the nation! 2. America’s Cup Finals | Saturday, September 21st | 1:10 p.m. | Pier 27 and 29 | The long anticipated finals are FINALLY here! Watch America and New Zealand duke it out live in the final race this weekend. Make sure to get there early, because everyone is going to want a piece of the action and it will be crowded. We’re rooting for ya, U.S.A.
3. Dance Party Flash Mob | Sunday, September 22nd | 2:30 p.m. | Powell Street, in from of WestField Mall | At ABCey we LOVE to dance, and therefore we are partial to anything that requires it! The dance is not choreographed, so just come in a costume of your choice and be ready to show off your moves. 4. Midnight Mystery Ride | Saturday, September 21st | Midnight | Mystery Location | Meet first at a local bar, and once the clock strikes midnight the ride begins! Destination: unknown. But we can guarantee that it will be awesome. Make sure to bring snacks and drinks to share once the final destination is reached. All levels of riders are welcome, and rain or shine, the ride must go on! Check out the Midnight Mystery Ride website the day of the event for destination information. Which events are you most excited for this weekend? Let us know in the comments, or on Facebook and Twitter!